TAKE THIS BIKE TO NEW PLACES. You might say this bike is the ultimate balance of performance and style. Designed for riders of all skill levels, it’s equipped with a sporty engine and has an optimal lean angle so it rides great. It also looks terrific with its blacked-out touches, compact frame and low-slung seat. And this year, it’s available in a stunning Candy Lightning Blue. As perfect as the Rebel 300 seems stock, it’s going to be hard to resist making a few tweaks. We say go for it. LOW SEAT HEIGHT - When it comes to seat heights, almost everyone likes them lower. At just 27.2 inches, the new Rebel has one of the lowest seats in anyone’s lineup. It’s comfortable when you ride, and it makes it easier to flat-foot it at stoplights or in parking lots. SINGLE SEAT WITH OPTIONAL PASSENGER SEAT - Travelling light and on your own? Want to take a friend along? Like the clean look of a solo seat? Like the versatility of a passenger seat? With the Rebel you can easily have it both ways, since the optional passenger seat, passenger footpegs and footpeg hangers all bolt up or remove in minutes. LIGHT WEIGHT - Weighing just 364 pounds with a full tank of fuel, the new Rebel 300 is a lot more fun and friendly to ride than some bigger machines—perfect if you’re just getting started, or if you’re looking for a nimble bike. The light overall weight helps performance, too. NARROW - Super-narrow, especially at the critical tank / seat junction, the Rebel makes it easier to get on and off the bike, and to put your feet down at stops. Plus, the Rebel fits a wide variety of riders. RIDER TRIANGLE - A rider makes contact with the bike at three points: the seat, the handlebar, and the footpegs. The Rebel’s rider triangle strikes the perfect balance between laid-back cruiser and more active sport riding. You ride with a commanding presence, and the minute you sit on a Rebel in your dealership, you’ll know it. SUPERIOR HANDLING - A lot of today’s motorcycles look great standing still, but disappoint once the road gets twisty. At Honda, we set high standards for the way all our bikes handle and feel, and the new Rebel is a perfect example—we’ve paid just as much attention to the way this bike corners and handles as we have its knockout styling. 2.9-GALLON FUEL TANK - One of the key items in motorcycle design is the fuel tank. Holding 2.9 gallons, the Rebel’s iconic fuel-tank shape is timeless, but functionally it also teams up with the bike’s great fuel efficiency to give you plenty of range. DIE-CAST ALUMINUM REAR SUBFRAME - Here’s a chance for Honda’s designers to take a functional part of the motorcycle and make it look extra cool. The aluminum subframe / fender mounts are strong, subtle, light, and provide a solid foundation for the optional / removable passenger seat. WIDE REAR TIRE - The Rebel’s low, fat 16 inch rear tire gives you plenty of grip, and helps lower the bike’s overall seat height and stance. And it looks tough, too. 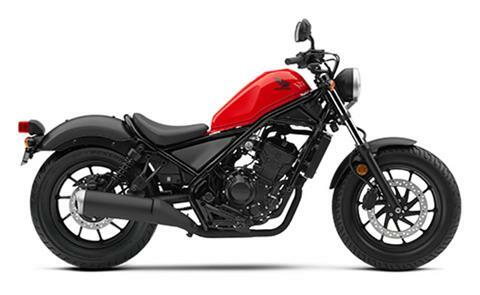 SPORTY ENGINE - Hondas are famous for their engines, and we’ve given the Rebel 300 a great one. First, the facts: it’s a single-cylinder with fuel injection, double-overhead cams and a counterbalancer. Because it’s a single, it’s light and super narrow, which helps reduce overall bike’s weight. It also offers the kind of torque and midrange power that’s well suited for all levels of riders. LOW PRICE POINT - Sure, the new Rebel is a knockout in terms of style, but it makes an even bigger impact in terms of value. Wait until you see how much machine you get for so little green! CAST WHEELS - Cast wheels front and rear are light, practical, easy to keep clean, and give the Rebel a look that tells you this is not built like a retro machine. OPTIONAL ACCESSORIES - Want to personalize your new Rebel a bit? No worries—we have you covered. Some of the most popular accessories include a rear carrier, saddlebags, windscreen, a 12-volt electrical accessory socket, and a passenger seat and footpegs. BLACKED-OUT STYLE - The new Rebel is a blank canvas for your self expression. But unlike the canvas you buy at the art store, this one’s not boring white. As is, its black-out engine pieces, frame, and bodywork elements look great during the day and even better at night. STEEL REAR FENDER - Real steel never goes out of style. The Rebel has a steel rear fender that's either color-matched to the tank or matte black. The paint looks great, and the steel fender helps provide a solid support for the optional / removable passenger seat. WIDE FRONT WHEEL - The Rebel’s wide 130/90-16 front tire not only looks great, but it helps provide superior handling and stopping power. GLASS-LENS HEADLIGHT - Another critical item in motorcycle design is the headlight. With the Rebel you get the best of both worlds. The lamp is bright and precise, while the round nacelle shape, solid aluminum shell and glass lens give the Rebel a character that exudes class. CLASSIC INSTRUMENT SHAPE - Another iconic element combining traditional and new, the Rebel’s instruments take a classic shape and fill it with totally up-to-date digital LCD information. BLACK-OUT MUFFLER - Forget about having to polish chrome—the Rebel’s black-on-black exhaust system blend perfectly with the bike’s overall look. And maybe the biggest plus? The awesome sound. WIDE FORK 41 MM - It’s what’s up front that counts most in style, and the Rebel knocks it out of the park. Of course the front suspension offers precise steering and a plush ride, but the fat 41 mm fork tubes give the bike a substantial presence too. WARNING: These products can expose you to chemicals which is (are) known to the State of California to cause cancer and birth defects or other reproductive harm. For more information go to www.P65Warnings.ca.gov.